R.A. Dickey: On 'Winding Up' As The Lone Knuckleballer In The Majors New York Mets pitcher R.A. Dickey is currently the only knuckleball pitcher in the major leagues. His new memoir, Wherever I Wind Up, explains how his life — and career — have mimicked the unpredictable trajectory of the difficult pitch he throws game after game. Most pitchers in the majors stick to fastballs, curveballs, sliders and change-ups when facing batters at the plate. But not New York Mets right-hander R.A. Dickey. Dickey is currently the only knuckleball pitcher in a current rotation. At 37, he's also one of the older pitchers in the league and has seen his career — and life — mimic the erratic trajectory of the difficult pitch he throws game after game. 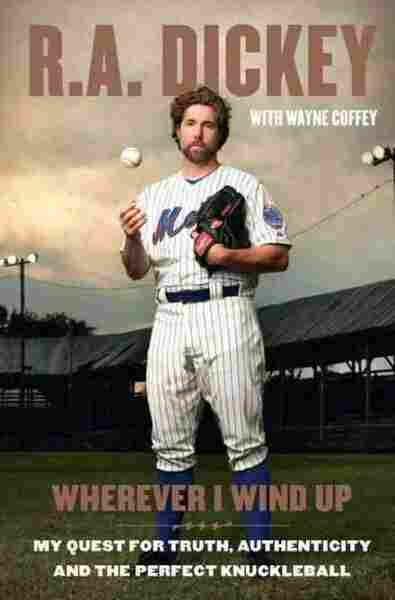 In his new memoir, Wherever I Wind Up, Dickey details how his selection as a No. 1 draft choice by the Texas Rangers was sidelined by the discovery that he was missing a ligament in his right elbow, how he bounced around the minors for years, and how learning to throw the knuckleball saved his career — and helped give him the 13th-lowest ERA in the National League last season. "A knuckleball is like trying to hit a butterfly in a typhoon," he explains to Fresh Air's Dave Davies. "It shakes side to side; it may go straight left on one pitch. It might go straight down to a right-hander on another pitch. It may stay on the very same plane on one pitch. The thing that makes a knuckleball effective is that you cannot predict which way the ball is going to move, which makes it an extremely hard pitch to hit." Dickey starts by positioning his knuckleball slightly above the catcher's helmet, gripping the ball with his pointer and middle fingers. He digs his nails into the horseshoe and his fingers into the leather underneath. After stabilizing the ball with his thumb, he releases the pitch and hopes for the best. "If you throw a good one, you make them look foolish," he says. "It certainly didn't start that way. I was all over the place early on in my career as a knuckleballer, and would have games where I'd walk five or six guys and have four or five wild pitches. ... It's a very unique, interesting pitch. It can be really ugly when it's ugly, but when it's on, it's fantastic." Dickey's road to the major leagues was not an easy one. His memoir recounts his childhood in Nashville, Tenn., where he grew up with an alcoholic mother, slept in vacant houses and was sexually abused by a baby sitter and a 17-year-old boy. For 23 years, Dickey told no one about the painful, abusive memories. "I had repressed it, but you can't really repress something like that to the extent that you never think about it," he says. "One of the mechanisms that I had developed was pouring myself into athletics. The baseball field, the basketball court and the football field were all kind of my refuges, places that I would take sanctuary from the pain of feeling like I was a fractured, less-than-human person." Dickey continued to devote himself to sports throughout high school and then attended the University of Tennessee, where he was an Academic All-American. In 1996, the Texas Rangers drafted him as a first-round pick after his junior year of college and offered him a substantial signing bonus. But after flying down to Texas to take a comprehensive physical, Dickey was told there was something wrong with his arm. He was missing a key ligament in his right elbow — and the Rangers didn't want to sign him. "They thought they had drafted damaged goods, and I went back to Nashville, Tenn., thinking that I may never throw for a professional team ever again," he says. "So my options became go back to school for my senior year, [and/or] try and get drafted again. And about 24 hours before my first class, the general manager [of the Texas Rangers] said, 'We'll give him $75,000. Take it or leave it.' "
Dickey took it and began his professional career toiling away in the minors. In 2001 and again in 2004, he was called up by the Rangers, but he was consistently up and down with his throwing. "I was very mediocre by my own admission," he says. "I could never get to the next place that I wanted to get to. I felt like I was capable of so much more but the guys in the big leagues were just so good. And so I had to come up with something else if I wanted to hang onto the dream of being a major league pitcher. And that's in 2005, when I made the transition to being a full-time knuckleball pitcher." After transitioning to the knuckleball, Dickey gave up six runs in his first start of the 2006 season, tying a modern-era baseball record. He was demoted to the minors in Oklahoma, where after a game one night, he decided to swim across the Missouri River — a big, fast-moving waterway with a lot of undertow. Five minutes into the swim, Dickey realized he was in big trouble. "Every stroke was a determined stroke to try to survive an experience where I [thought that I] may drown," he says. "I had given myself over to the fact that this was it, I wasn't going to make it. The undertow was pulling me down." Dickey's feet hit the bottom of the Missouri just as he was about to open his mouth and take a breath underwater. He bounced up and dog-paddled toward the side, where a teammate plucked him from the water. "I look at it as almost a baptism of sorts," he says. "I went into the Missouri River, I was hanging on by a thread professionally. ... And when I came out of the river, I ended up going 11-2 with a 2.80 ERA and became the Pacific Coast League pitcher of the year. I think when I came out of the river, I was so consumed with just wanting to live in the present well — wanting to enjoy every second — that I think that carried over directly into my pitching, and I just cared about each pitch singularly. ... And I decided that that's how I wanted to live my life." A perfectly thrown knuckleball has a little less than a quarter rotation from the time it leaves your hand until the time that it gets to the catcher's mitt. "As a conventional pitcher, you throw a fastball, a curveball, a slider, a change-up — and those pitches are all thrown with a certain amount of spin on them. With a knuckleball, you're doing the opposite. You're taking spin completely off the baseball and you're leaving it up to the physics of air resistance and seams on the baseball. ... So, a perfectly thrown knuckleball has a little less than a quarter rotation from the time it leaves your hand until the time that it gets to the catcher's mitt." "The pitch is not thrown very often, and there's not a lot of guys out there. And a lot of managers don't know how to manage a knuckleballer, because it can be great one inning, and then the next, you go out there and you don't have a great feel for it, and you throw some tumbling balls up there, and they get hit around, and then the next inning you get it back and no one can hit you. ... It can be a very lonely place because you don't have someone to turn to and say, 'Golly, what am I doing wrong?' It's up to you, you have to be your own best coach." "There's something divine about that. I began throwing the knuckleball exactly when I started working on my life and trying to become who God had authentically created me to be. And I think those things parallel each other and continue to do so."